We spent the final day of our whirlwind Europe trip (which included Slovakia, Czech Republic, and Austria) in Budapest, Hungary. Despite spending pretty much the whole trip in cities near the Danube River, we also actually made it to the river for the first time in Budapest. One of the first things we were told is that it should be pronounced "Bud-a-PESHT" - not "Bud-a-PEST" - while on our tour. Up until this point, the only Americans I've ever heard pronounce it "-PESHT" are Foreign Service members, and I always thought it sounded kind of snobby. For example, I don't say "France" like "FRONS" in English, even though that's closer to the French pronunciation. But now I know at least one Hungarian who prefers the "-PESHT", so for the rest of our trip that's what we said. We may have bitten off more than we can chew on this vacation, as we were exhausted by the time we made it to Hungary. The photo above is about as far as we got on our three-hour walking tour before we decided to call it quits and just head back to our room early. 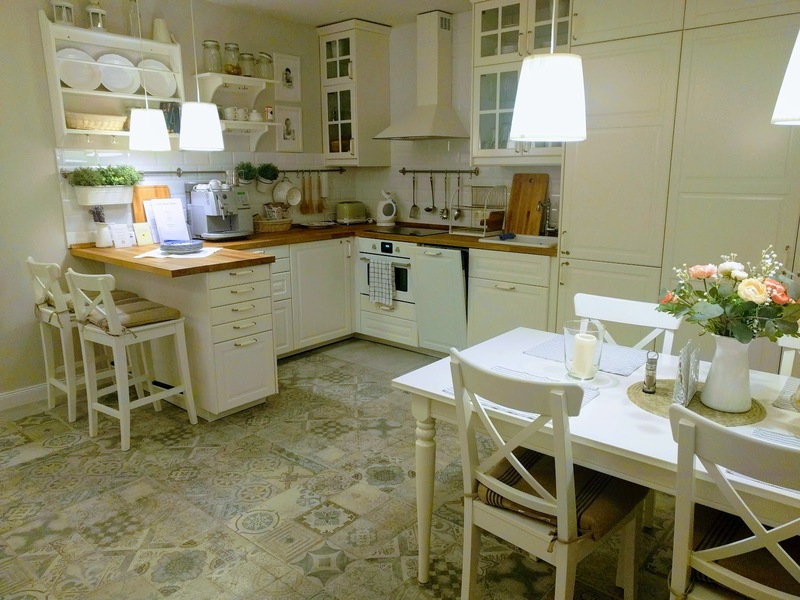 Thankfully, we had a very cute apartment to stay in (the most Airbnb-style place we've ever stayed that wasn't an Airbnb). Our host even provided us cookies! 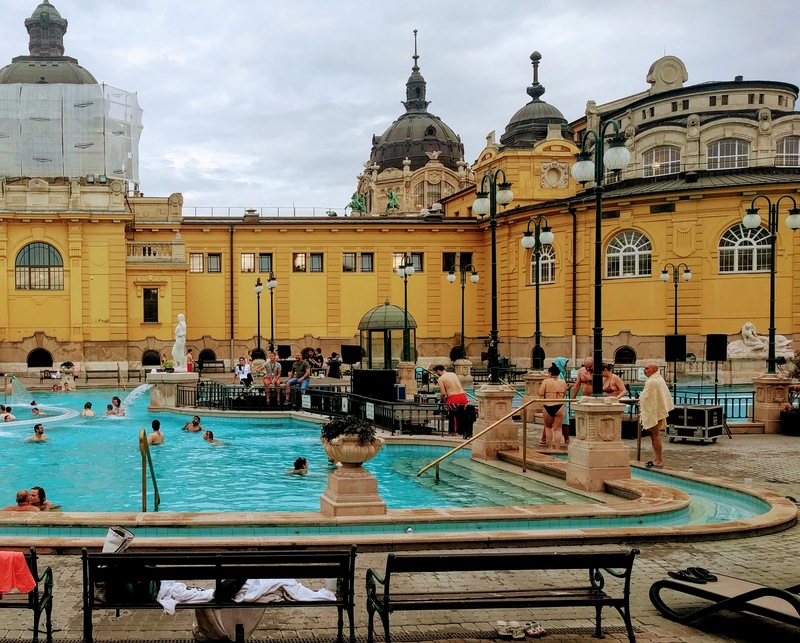 By far, though, the most memorable part of our short time in Budapest was the bathhouse (we chose Széchenyi Baths). We spent hours trying all the different pools and saunas with varying temperatures and other features. Since it was a Saturday night, we saw them setting up for a "Sparty" (spa party) after-hours where expensive tickets got you admission to the bathhouse transformed into a club complete with bars, music, and (judging by the pre-gaming crowd outside) shenanigans. That may not be our scene, but it's a cool concept. 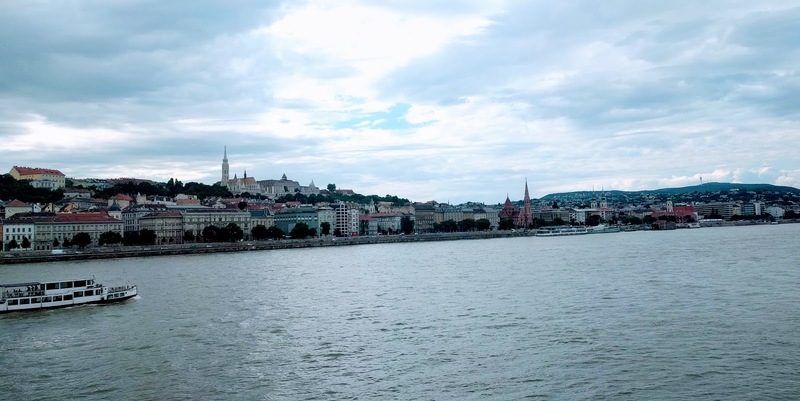 So Budapest was beautifully, historically, and culturally rich, but we honestly didn't get a well-rounded experience because of how worn out we were from our travels at this point. Thankfully, it also turned out to be a delightful place to relax. We would definitely visit again! We happened to be there during two major events: Pride Month and the World Cup. Although we missed the big Pride Parade planned the day after we left, we did get to see cool crosswalk signals like the one above. There were variations all around the city of a man and a woman, a man and a man, and a woman and a woman. As for the World Cup, there were plenty of places to stay on top of the games and enjoy the company of fellow fans. It seemed like every restaurant, bar, and cafe had set up at least one screen to attract hordes of soccer - uh, I mean, football - loving customers. Vienna had more parks than I remembered from my last (albeit very short) visit there, and our tour guide mentioned 50% of the city's area is actually green space. The rose garden was in full bloom, and after I finished each day's training we spent hours walking around the beautiful city. 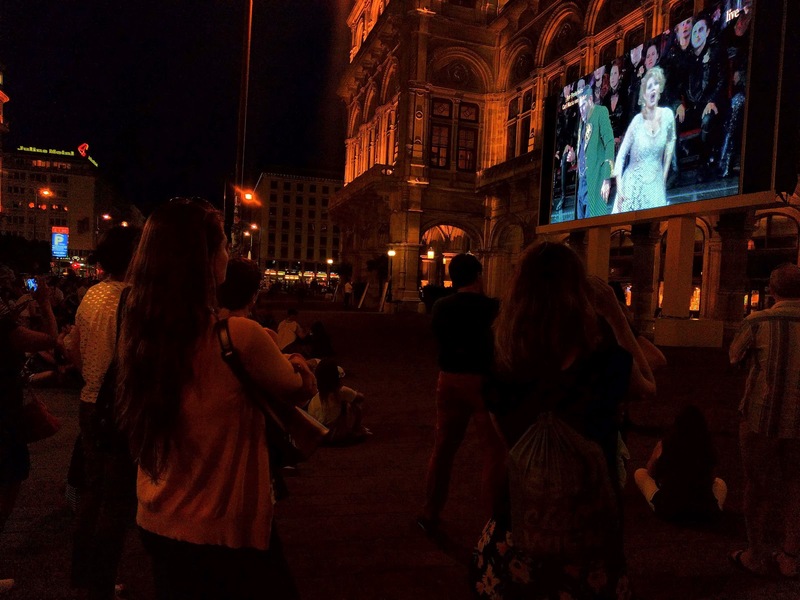 ...and, even better, to enjoy a free, live screening of Der Freischütz right outside the Vienna State Opera. 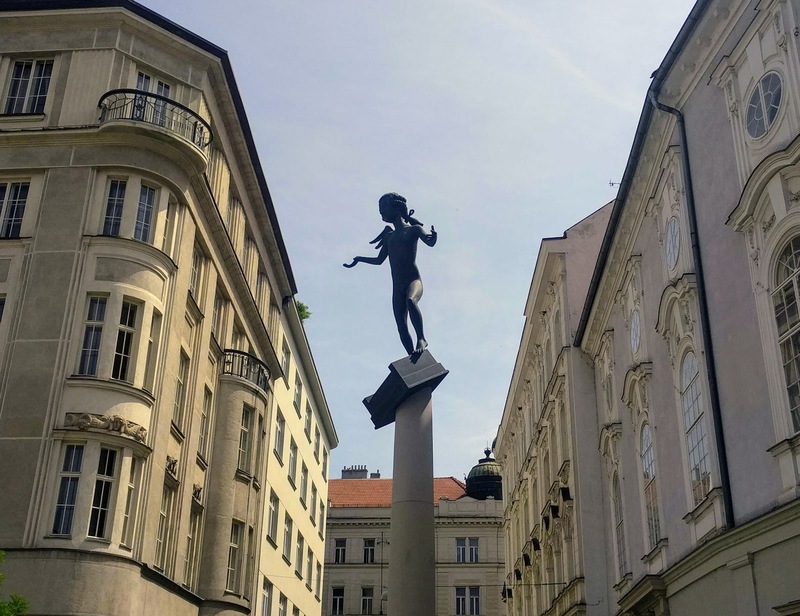 It was so cool that they made this (normally extremely expensive) performance available to the public at no charge, so everyone could have a chance to enjoy the arts and culture for which Vienna is so well-known. You could tell the Austrians were proud of their cultural heritage and happy to share it. Not-so-subtle hints of Klimt, Mozart, and more were everywhere. Speaking of culture, we highly recommend the Haus der Musik, an interactive museum of history, music, science, and sound. We went after dinner to score cheaper night tickets, and they were well worth it. 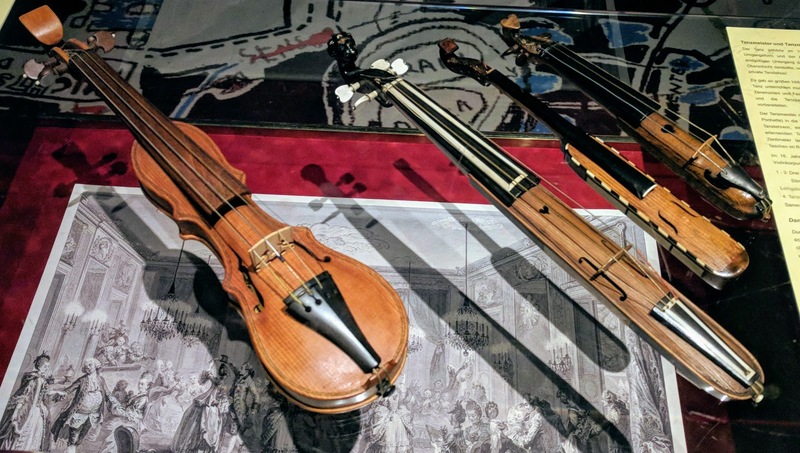 I learned a lot, such as the fact that pocket violins (pictured below) once existed and were a suave way to show off your talents in social situations. We also used a music generator to make monstrous cacophonies with our names, which were hilarious. We were mind-blown by the Shepard scale, an "auditory illusion" that can make you think you're hearing a scale that progresses forever. (You can learn more about that and listen to it yourself here and here.) There was something in the museum for so many: classical music lovers, Viennese history buffs, technology enthusiasts, and more. We stayed right up until the building closed. Of course, we ate a lot. Really, a lot. 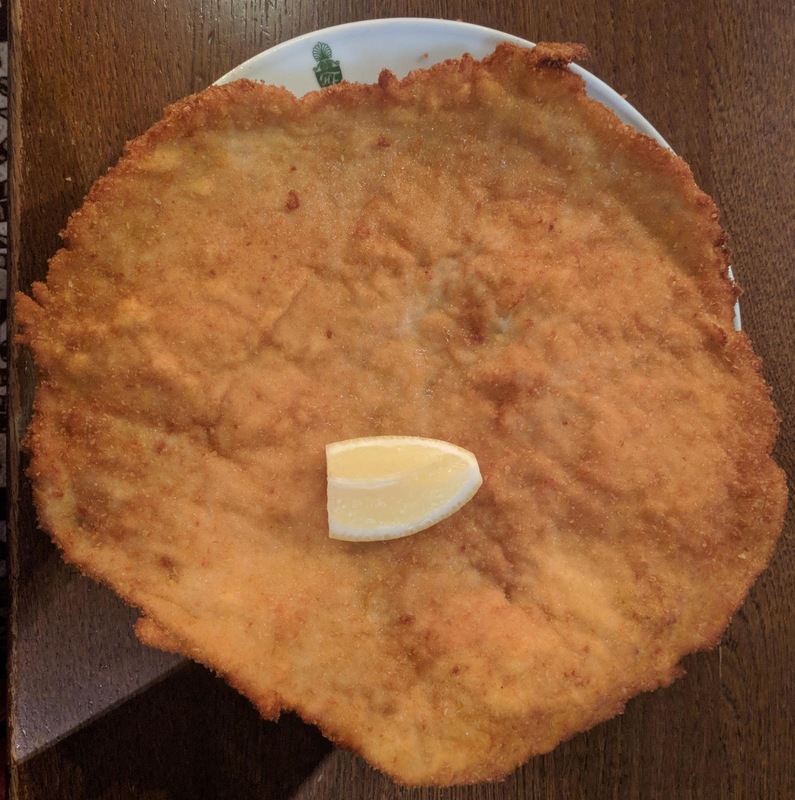 I think we ate even more in Austria than we did in Australia (which is saying something).We both had the classic Wiener Schnitzel at the famous Figlmüller. 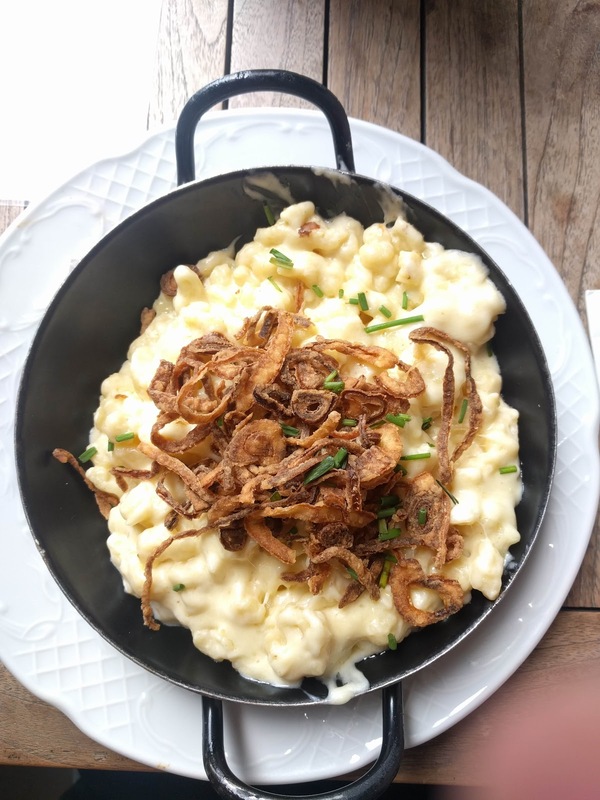 M then proceeded to order the exact same dish pretty much every day for the rest of our time in Vienna. 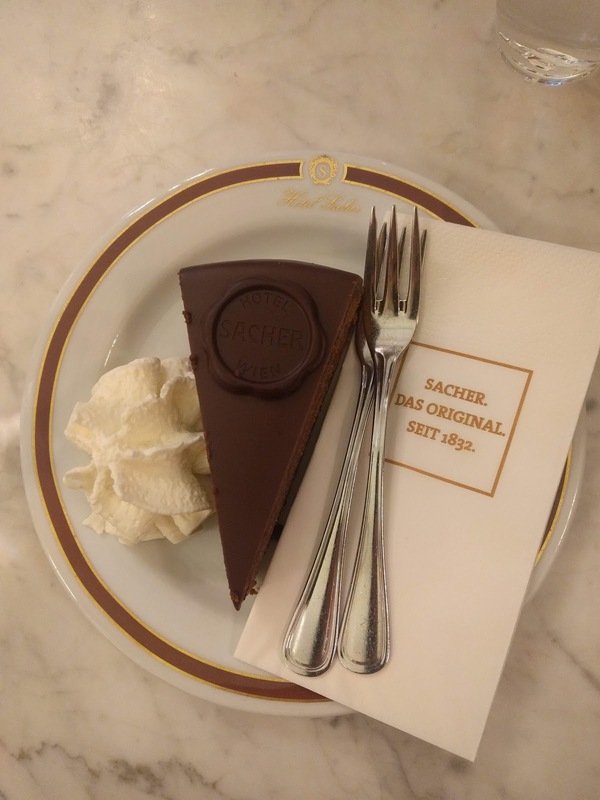 My coworkers also insisted we try Sacher-Torte, a classic chocolate cake with apricot jam, served with unsweetened whipped cream. It was a little dry by modern tastes, but it was delightful with a hot drink alongside it. We also enjoyed cheap street food, including the very tasty Käsekrainer (cheese filled sausage). 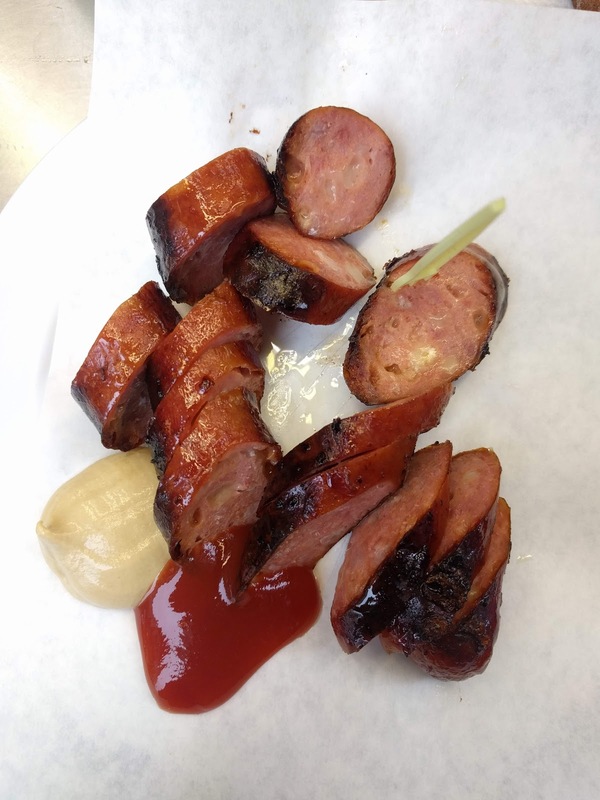 My Austrian friend shared that those street sausages are a late-night lifesaver for drunk locals heading home after a great night out on the town. I also tried a dumpling/pasta dish I'd never heard of before: nockerl. Mine was cheesy and topped with sinfully delicious fried onions. It tasted like a cross between gnocchi and mac-and-cheese, and it was amazing. We also swung by the Naschmarkt, a street market recommended by a colleague, just to check it out one afternoon. It had so much more than we expected, including everything from Asian restaurants to African spices to an insane amount of European cheeses. 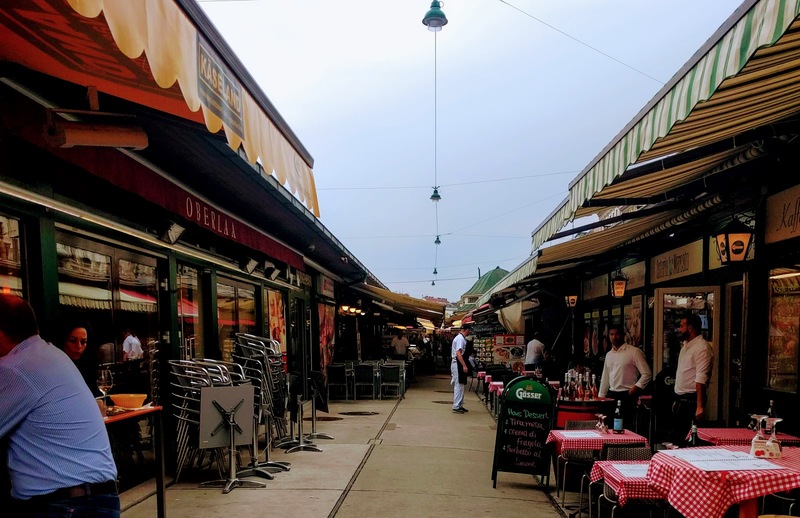 I do doubt, though, that it would be described as a "street market" in most of the developing world, as most of the "stalls" were actually well-established and very stationary shops or restaurants. On our last day, we finally found time to take a free walking tour, which was excellent. 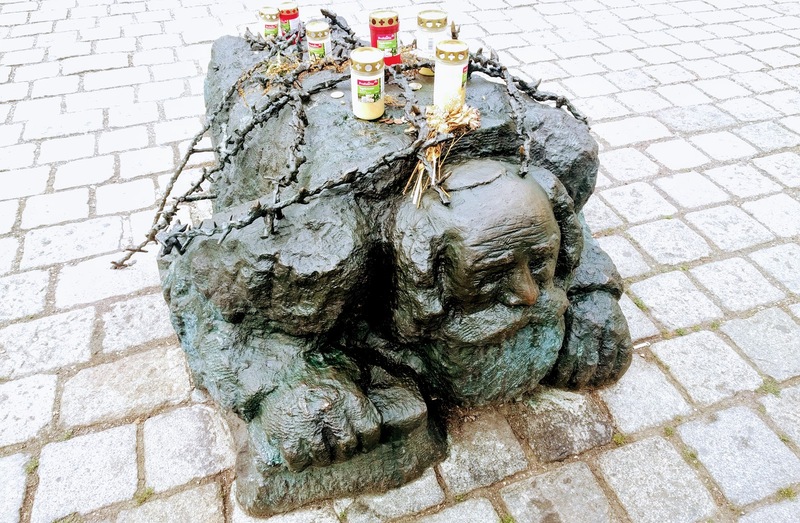 We learned about Austria's painful history, including on our stop at this memorial of a Jewish man forced to scrub the city streets with a small brush as a form of hard labor and humiliation. On the same tour, we also heard uplifting stories that make Austrians proud. 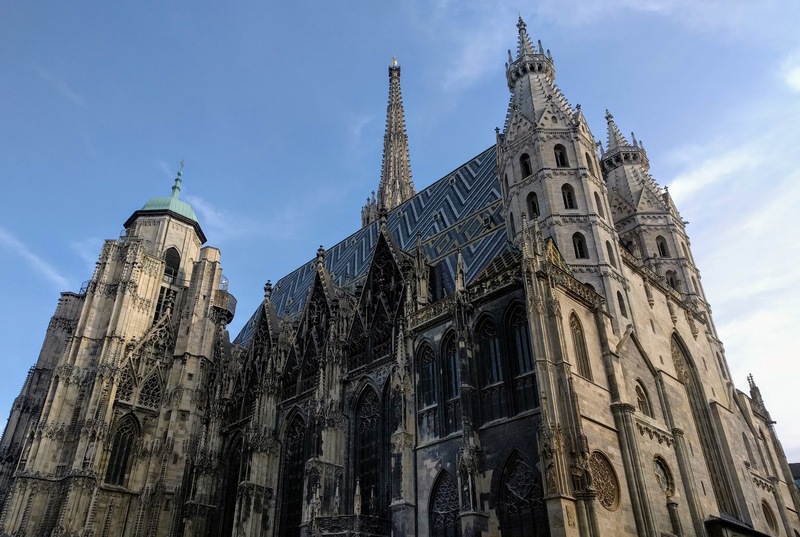 For example, we learned that St. Stephen's Cathedral is not only a signature landmark but a vibrant heritage site and a witness to many notable people and events throughout the region's history. 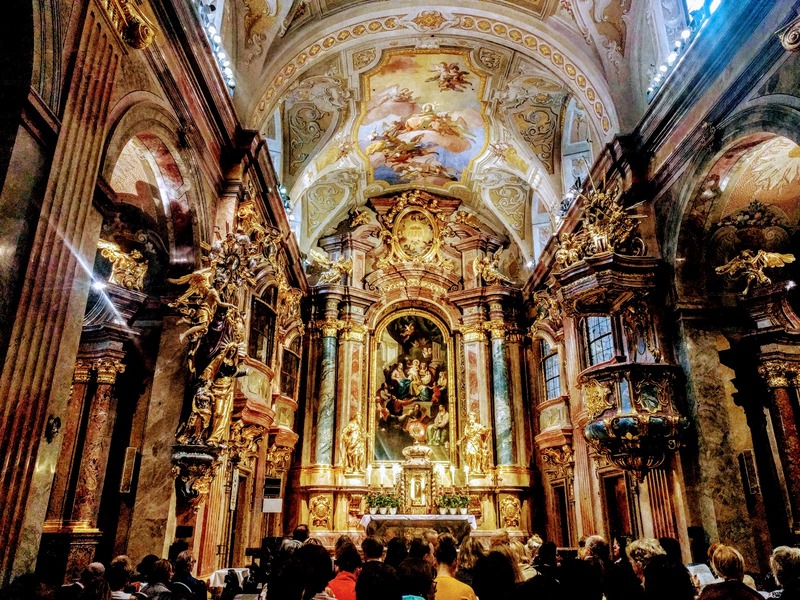 At the end of the day, as a deep lover of classical music, my favorite thing we did during our time off in Vienna was attend a classical concert: a string quartet playing Mozart and Haydn in an intimate local church (the first photo of this post. How cool is that? (We booked our concert here, but there are actually a few vendors selling tickets to concerts like these in Vienna.) I've had this stuck in my head ever since. We feel so lucky to have had the opportunity to spend a week in this wonderful place. It went by so fast! 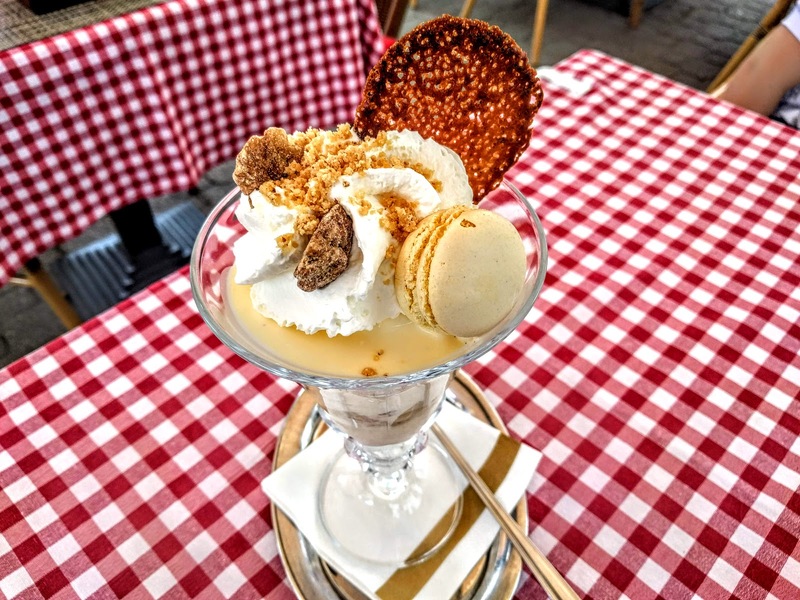 Although we didn't get a chance to explore the rest of Austria, we can now attest from personal experience that Vienna alone has plenty to keep travelers busy. Too much even, to fit in just one week! We almost missed our train, but thankfully it was delayed twenty minutes and we caught it in time. 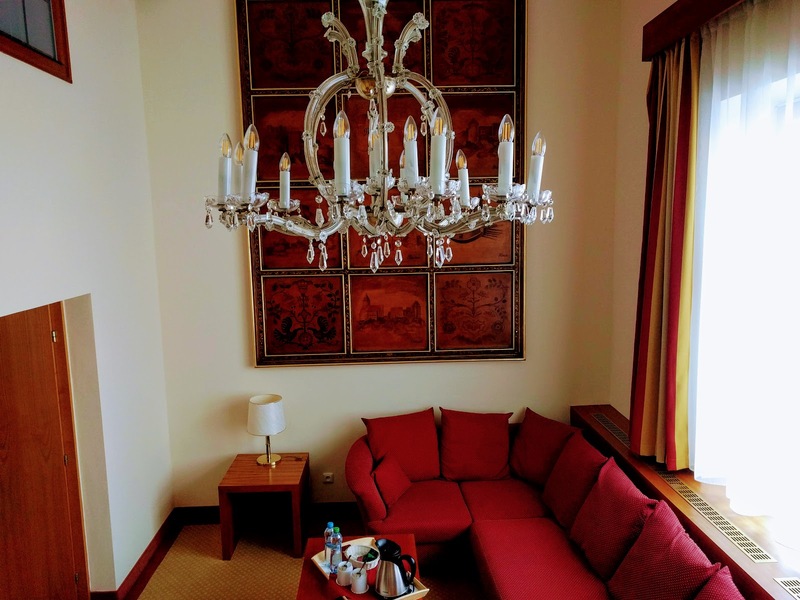 Then, when we reached our hotel we received a free upgrade to the Executive Suite, which had a lovely library next to the bed and this chandelier overlooking the living room. We loved it but wondered why anyone would ever need a room so big. After we dropped off our bags, I was overcome with a craving for fruits that were either nonexistent or extremely expensive in Kenya. At the same time, I remembered summer berries were in season. After our concierge directed us to the local fruit market, I proceeded to gorge myself on an entire box of blueberries. They didn't even last long enough for a photo, and they were worth every bite. One of my favorite stops was this statue of none other than Mozart, located where he apparently played as a 14-year-old. According to our guide, nobody could remember how he looked as a kid so they just put his adult head on a child's body. It honestly kind of reminds me of this creepy boss from the video game Persona 4. Like in Slovakia, the Catholic influence in the Czech Republic was clearly very strong. 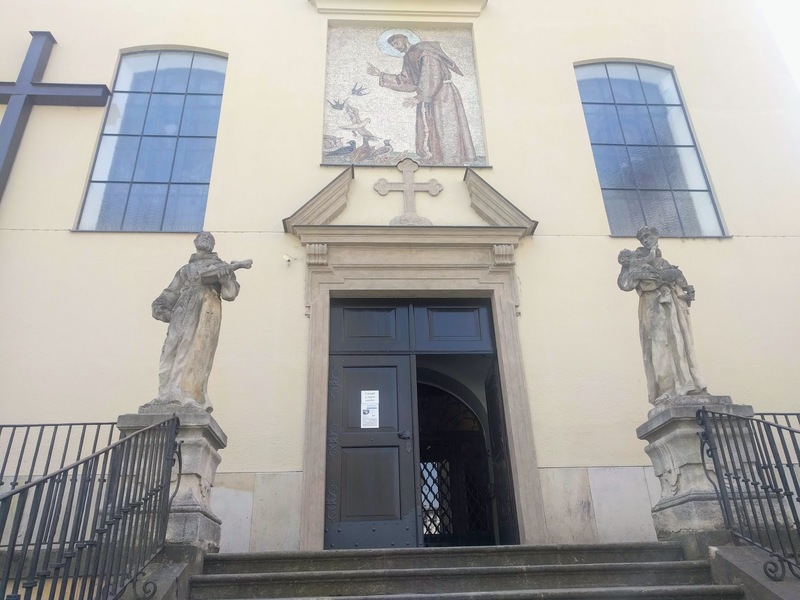 We saw the outside of a Capuchin monastery famous for the crypt beneath the church, where about 150 Capuchin brothers and 50 benefactors are buried. Due to the ventilation system of the crypt, the bodies there were naturally mummified. I'll admit I don't really understand the science behind it, but I can see why people fought so hard to get buried and preserved there. We also saw a beautiful cathedral where a wedding was happening: the Cathedral of St. Peter and Paul. 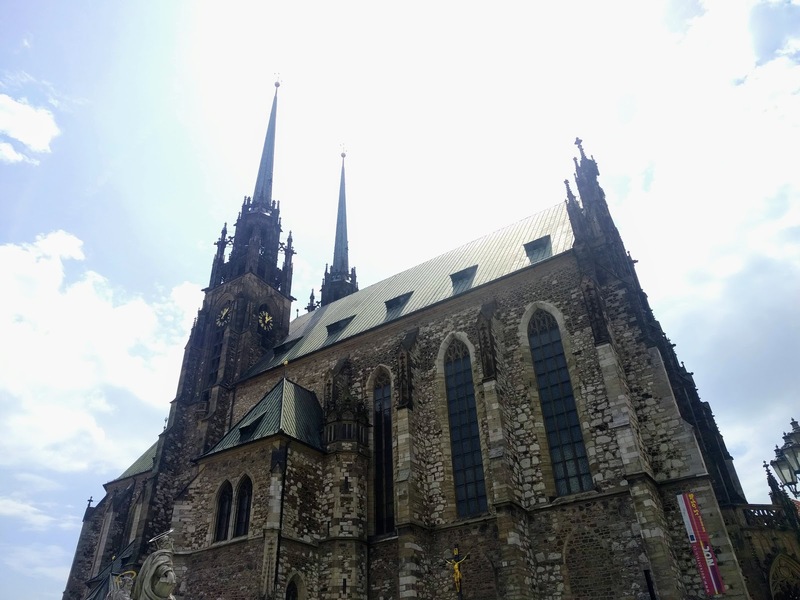 Its bells ring at 11am instead of the traditional noon due to a legend dating back to the Thirty Years' War. Supposedly, the invading Swedish army laid siege to Brno and set themselves a deadline of noon on a certain day to capture the city. 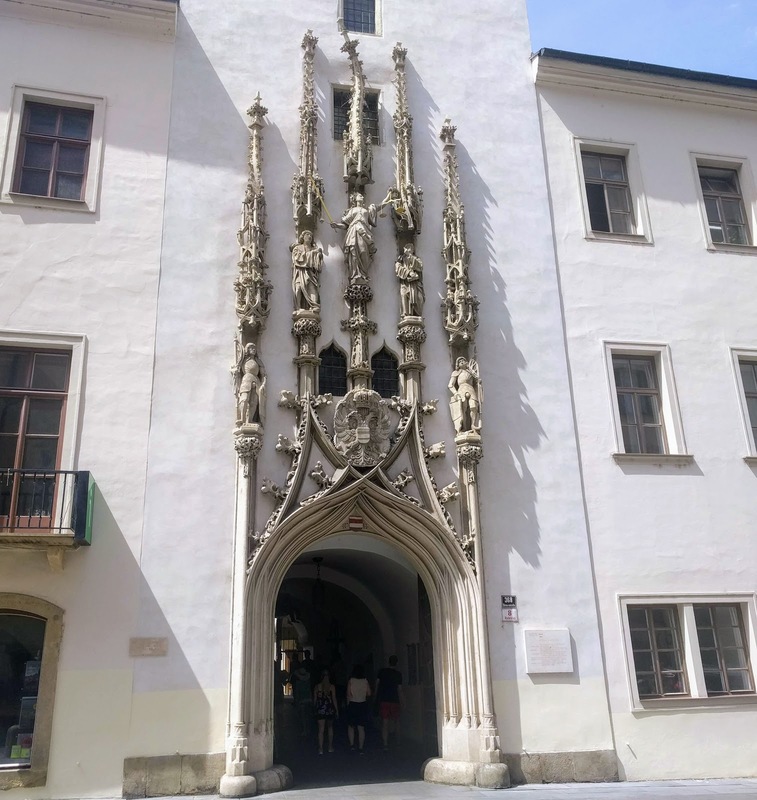 Under attack, the shrewd inhabitants of Brno rang the bells an hourly early, tricking the Swedes into thinking it was noon and leading to their retreat. Cool, isn't it? 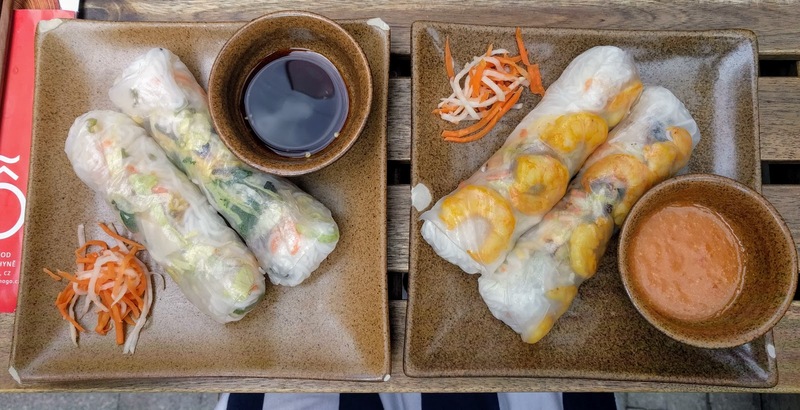 There were two sizable populations in Brno we didn't expect to find: Vietnamese immigrants and vegans. Thankfully, we had enough wiggle room in our schedule to pay tribute to both types of food. We had a tasty Vietnamese lunch of fresh spring rolls and beef fried rice at Gỗ, and we also tried vegan ice cream made with coconut milk (honestly way better than I, a non-vegan, expected). Of course, we also made space in our stomachs for traditional Czech food, including cabbage soup (yum! 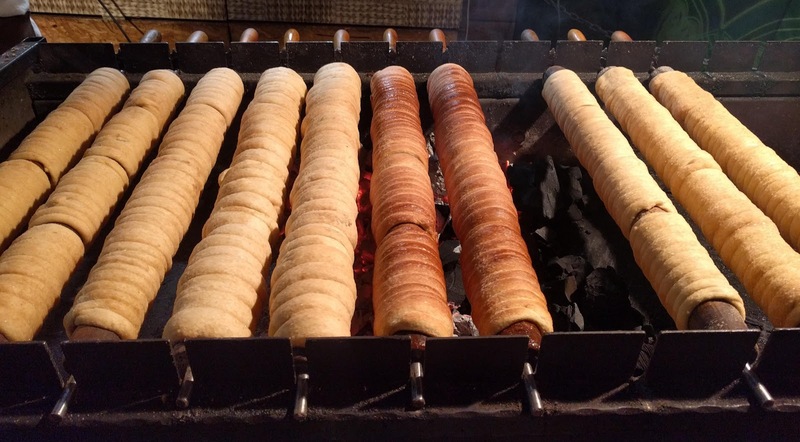 ), sausage, and a magical, roasted cinnamon-sugar donut cylinder thing called a Trdelník (pictured below). Please don't ask us how to pronounce it. 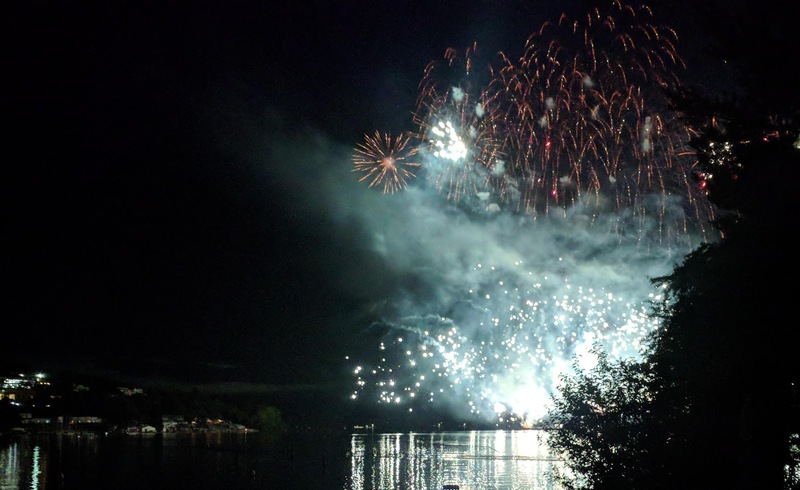 At the end of our tour, we learned that we were lucky enough to be in town one of just a few nights in the whole year when Brno hosts a fireworks festival where teams from several countries in the region compete. To catch Romania's performance, we headed out of the city that night to the festival site, which was decked out in carnival splendor, food trucks, and many bars. 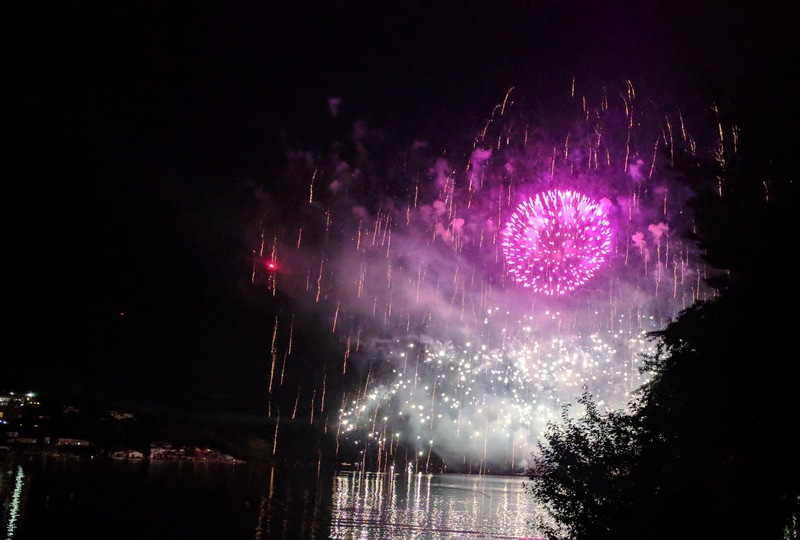 We sat on a grassy hill and enjoyed the show, which had lovely traditional music and some of the most awe-inspiring fireworks I'd ever seen (even more impressive considering this was apparently Romania's first year competing in the festival). The reflections of the displays in the lake, visible in the first photo of this post and below, added to the spectacle. We may have overdone it this time. I needed to go to Vienna for a work trip, M came along, and we decided to cram a day each in three extra countries while we're at it. Why not? The first 24-hour stop on our European adventure was Bratislava, Slovakia. 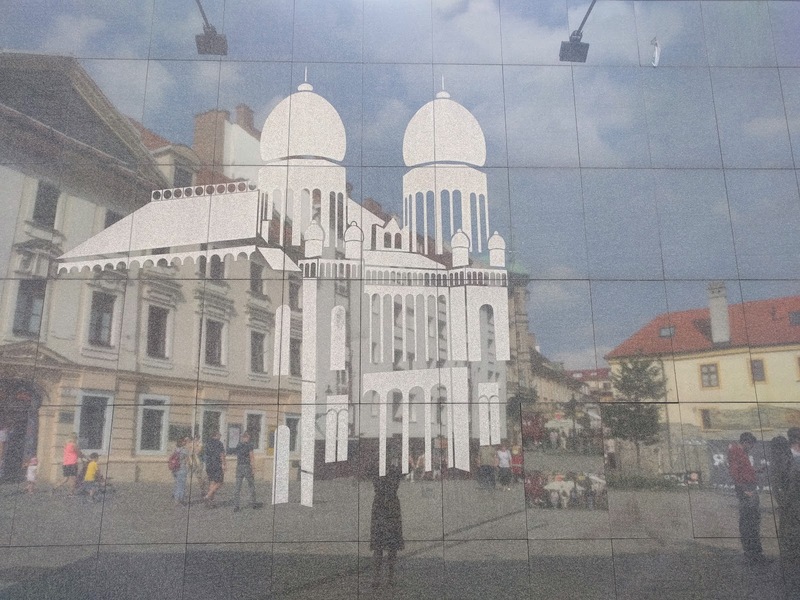 (You can read about our next stop, Brno, here, and Vienna here.) We had heard this city was somewhat sleepy compared to the others on our list, so we figured it would be a nice way to start our trip after a moderately long transit from Nairobi (~11 hours). It was beautiful! 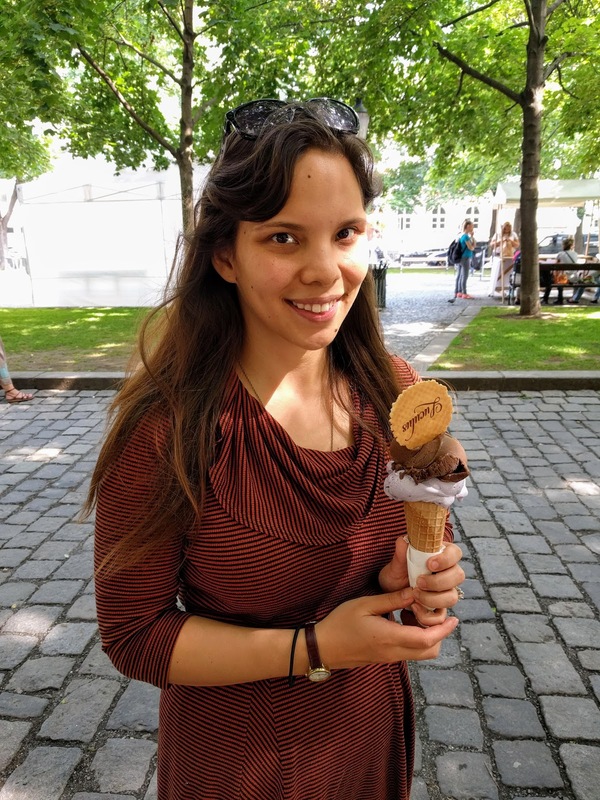 When we arrived, it was a little warm outside so we immediately scoped out ice cream shops. Based on good reviews online and a long line, we settled on LUCULUS Ice Saloon. It was exquisite - my lavender and chocolate ice cream was served in what I think was the best-tasting cone I've ever had. This was also our first taste of the fact that very few people we would interact with on this trip would speak English. We did join a free walking tour (in English) of the city. 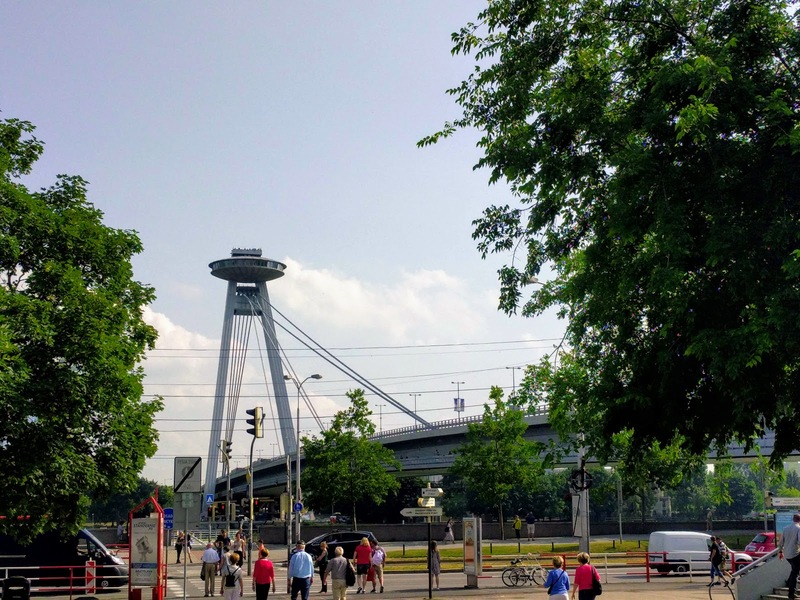 We enjoyed landmark sights, like the "UFO bridge" above, and learned some history, such as at the memorial of a destroyed synagogue below. 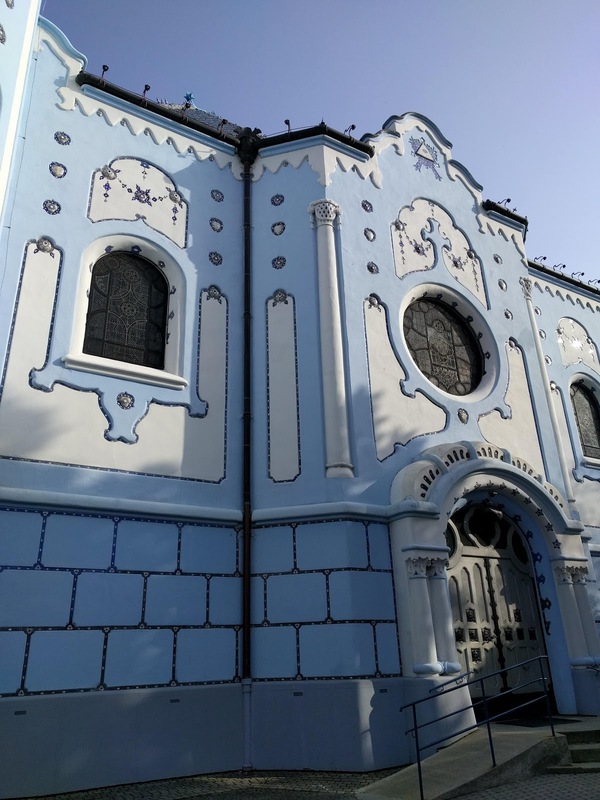 If I remember correctly, there used to be 75,000 Jews in Slovakia and by the end of WWII there were only 5,000 - the rest had fled or been deported to concentration camps. As heartbreaking as it was, I was so glad they committed to remembering that tragedy. 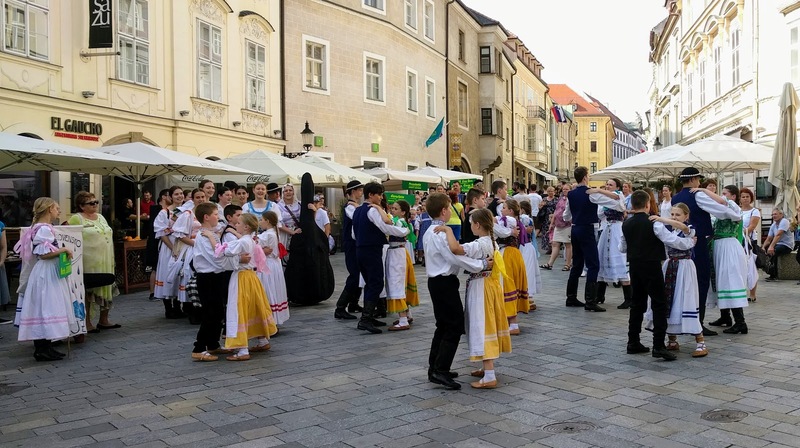 In the middle of our tour, we stumbled upon a folk dance and music parade (the first photo of this post). We were amazed at how young some of the performing children were and how well they executed the songs and fancy footwork. Our guide shared that they train from a young age to keep their culture alive and perform at cultural festivals throughout the summer. 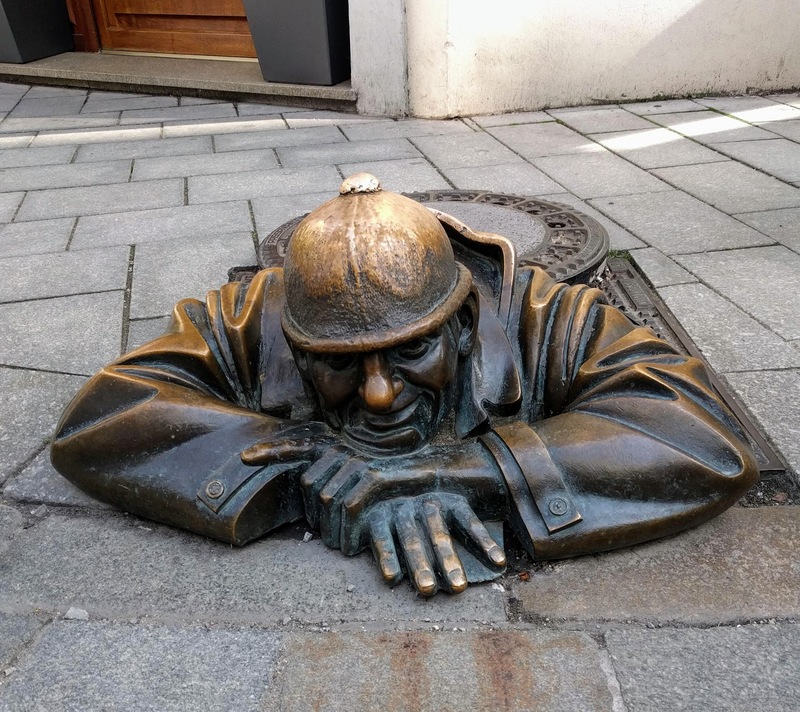 We also snapped this photo of the most famous statue in Bratislava: Čumil. There are two stories explaining him, and neither is very pleasant! One is that he was installed around the time women started wearing shorter skirts, so he's just a pervert trying to get a good view. The other is that he's a lazy, communist-era Slovak worker just slacking off until he can clock out and go home. Of course, we couldn't leave Slovakia without trying Slovakian food. We went a little overboard at Bratislava Flagship Restaurant, recommended online and by our tour guide for authentic food at a reasonable (less than 10€/person) price. 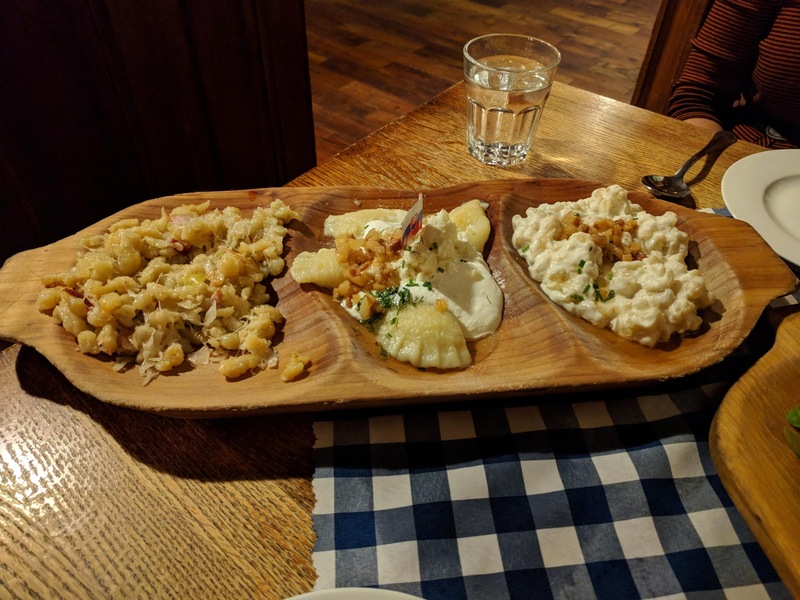 Pictured above: a Slavok platter for two that included sheep cheese-covered dumplings, pierogis with sour cream, and dumplings with sauerkraut and bacon. The things that look like nuts are actually deep fried fat. (Yum!) 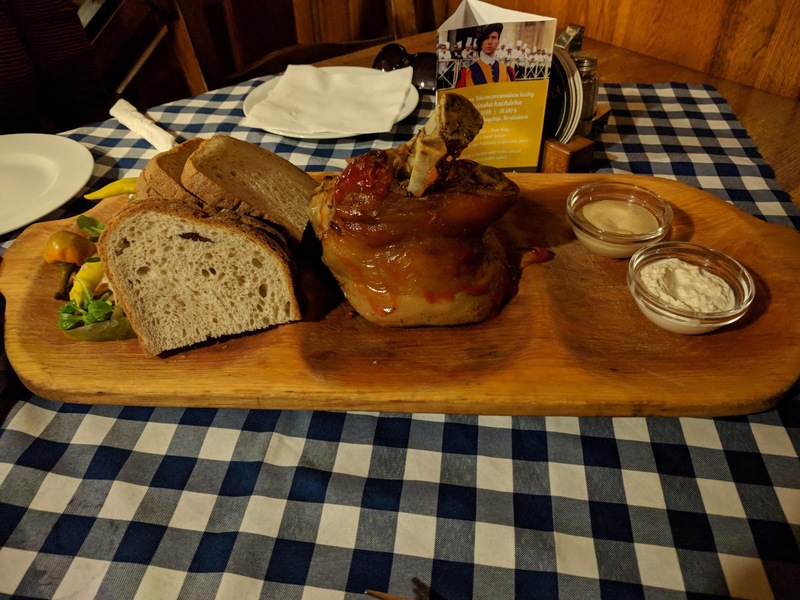 Pictured below: a pig knuckle that also easily could have fed two or three. When we saw it on the menu, we knew we had to get it on the recommendation of my boss, who had served in Eastern Europe twice. The food was divine but far from anything I'd consider healthy. I couldn't decide if we were eating more fat, carbs, or sodium, since everything seemed packed with all three! Bratislava was so delightful, and we actually didn't get much of the "sleepy" vibe some tourists complained about online. (Or maybe we're just "sleepy" people?) I also loved the conscious devotion to preserving tradition in the face of globalization. (Did you know in Slovakia boys whip and dump water on girls on Easter Monday? Or that Slovak families keep carp in their bathtubs in preparation for Christmas? You can read more about those traditions here and here, respectively - they're fascinating.) We highly recommend Bratislava for anyone traveling in the area. At least for our visit in the summer, it was amazing! Wow. Just wow. 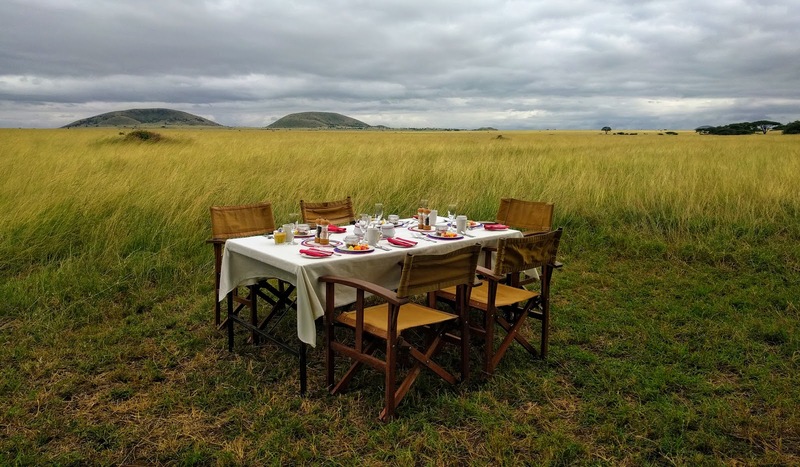 We joined friends for a safari weekend at Ol Donyo Lodge in Chyulu Hills, nestled between Amboseli and Tsavo West national parks in Kenya. National Geographic named it one of their top unique lodges of the world, and it's considered part of Relais & Châteaux, an association of top-notch hotels and restaurants we hadn't even heard of before this trip. We drove there from Nairobi in less than four hours, because M is a speed demon and passed everyone. We didn't know we were in for such an intensely luxurious experience until we saw our rooms. "Luxury" doesn't even do it justice. Our rooms had open air views of the plains (pictured above was the view from our bed), tea and cookie service, two showers and a bathtub, a private pool, and a rooftop outdoor starbed. The lodge also had a larger pool, free WiFi, and an open bar. 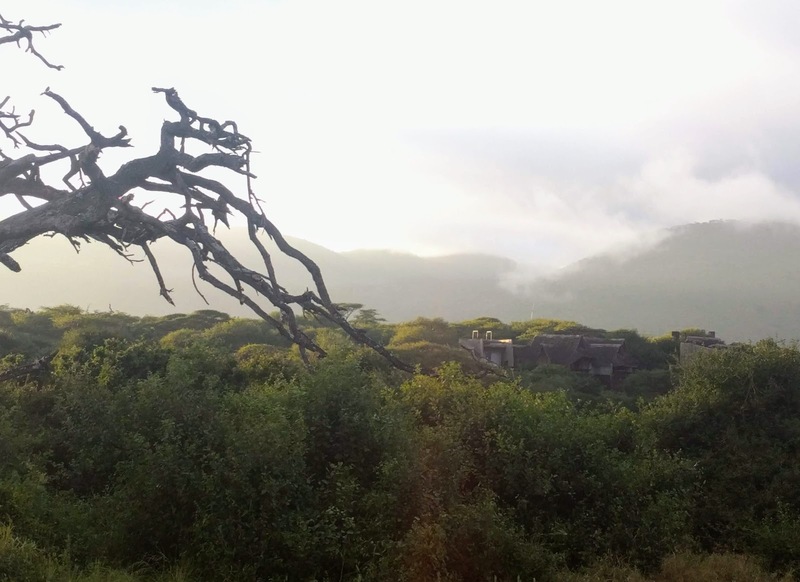 Our stay was all-inclusive of accommodation, food and drink, game drives, and other activities. 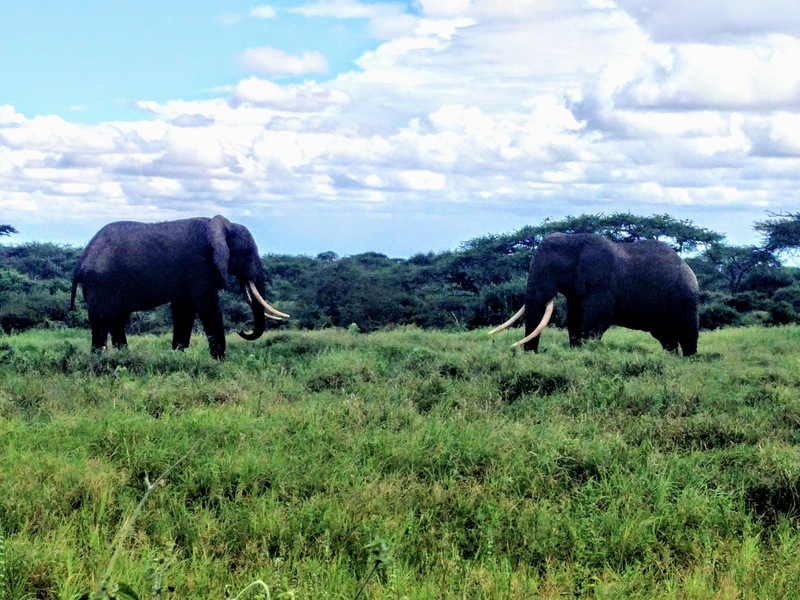 We started our too-short weekend with a delicious lunch, from which we enjoyed a view of elephants at a watering hole. 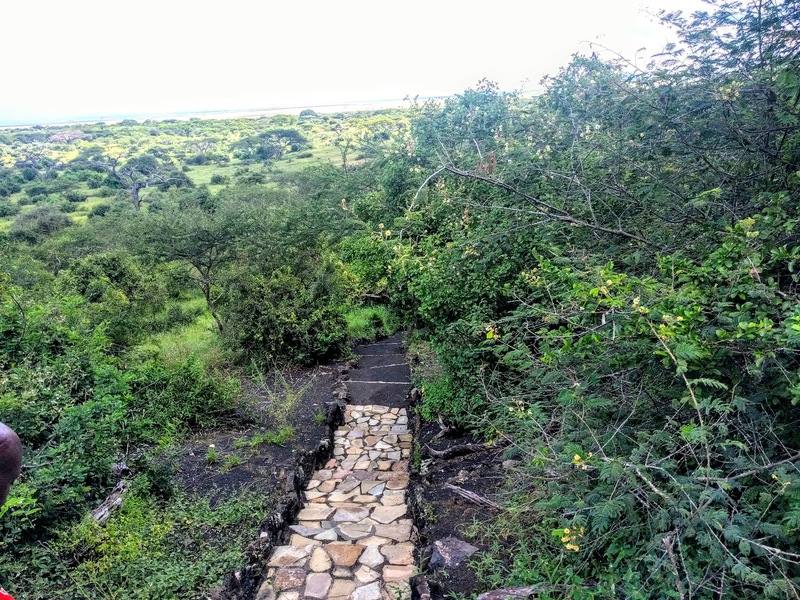 After lunch, we took this beautiful path down to the lodge's "blind", a covered space from which we could surreptitiously view the animals at the watering hold up close. We watched as one poor elephant tried to join the rest of the group at the watering hole, only to be left waiting from a distance, unwelcome. 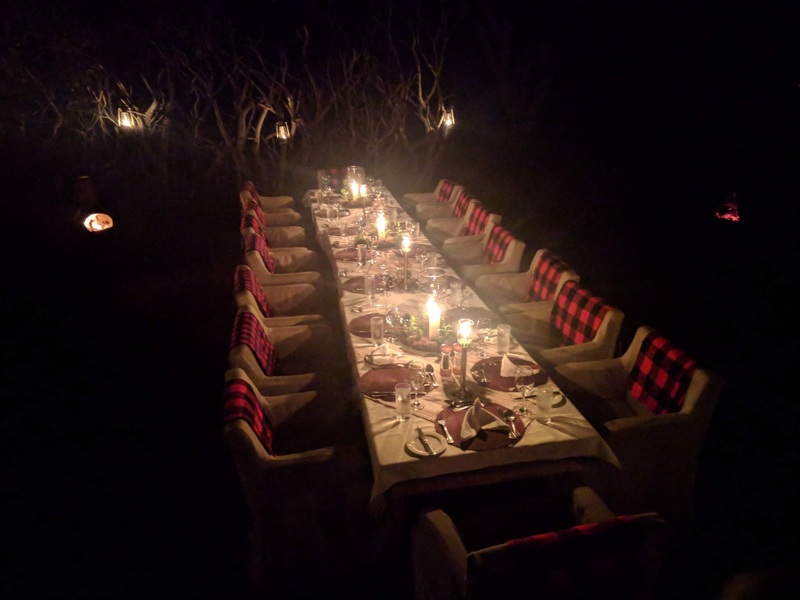 We then feasted on a divine dinner and a night game drive - which we had never done before. The guide used a filtered spotlight to avoid confusing and distressing the animals. 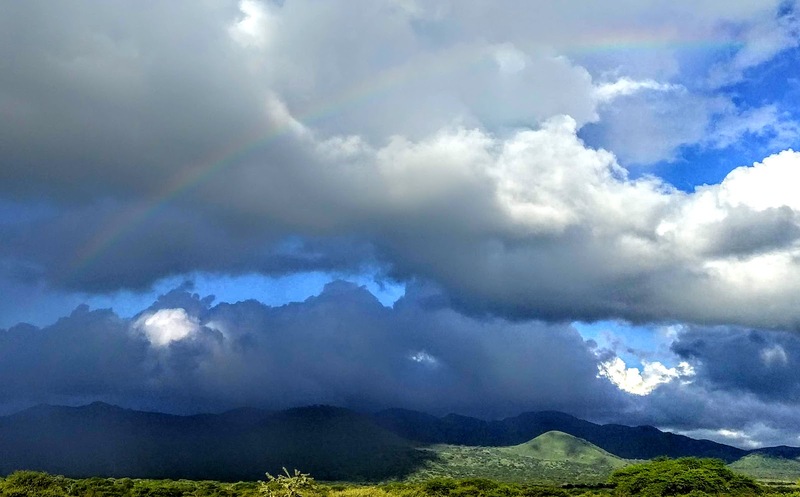 We saw a few things we'd never seen in the wild before, including huge black-and-white African porcupines and spring hares (think adorable miniature crosses between rabbits and kangaroos that we didn't even know existed). The next day, we woke up bright and early for a bush walk with a guide and an armed guard... just in case. The view of the lodge from the trail in the early morning light was so lovely. Our guide took the opportunity to teach us about the flora and fauna of the area. I was particularly fascinated by this plant, the whistling thorn acacia. 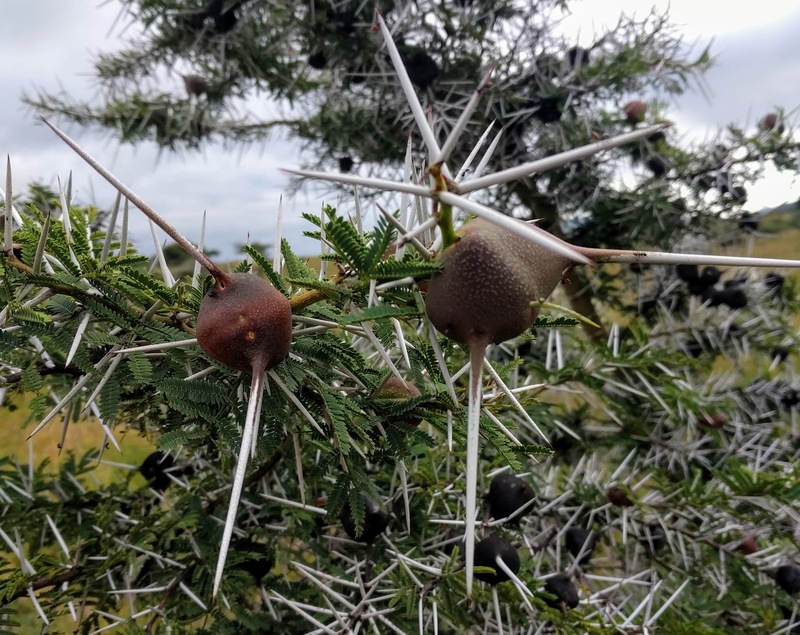 Ants live inside the fruit pods and come out to help defend the tree if threatened (though I found the thorns plenty formidable enough on their own). We then hopped back in a safari van to follow up on a lion sighting. 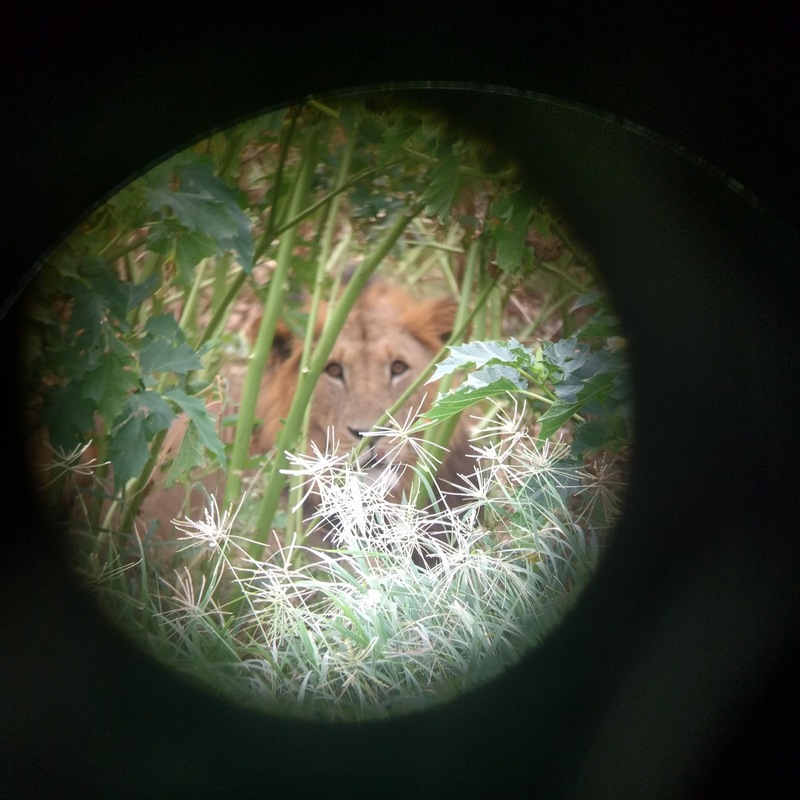 Sure enough, we saw three big male lions relaxing under some foliage. M has some serious skills taking photos with my phone through a binocular lens, doesn't he? Then, we feasted on a luxurious breakfast right out in the plains (the first photo of this post). Every aspect of the experience had that special touch of extra classiness none of us expected. For example, we anticipated some snacks wrapped in foil for breakfast - not multiple courses at a dining table with chefs nearby freshly preparing the food. 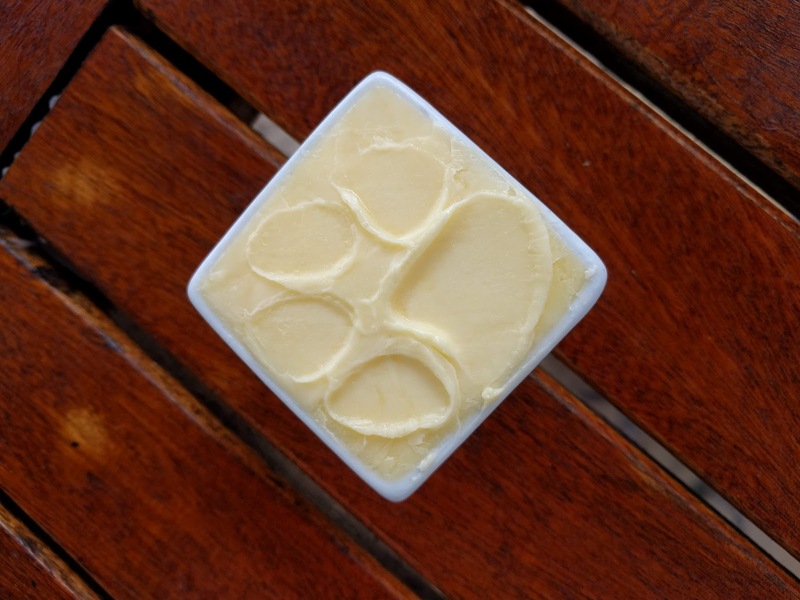 Another example of their exquisite attention to detail was the signature paw print in each butter dish we used this weekend. 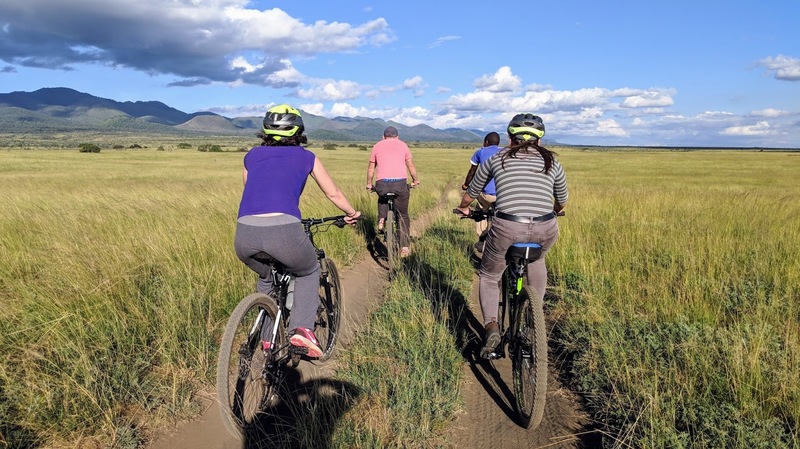 After a quick break back to the lodge and a very tasty lunch, we headed out to the plains for mountain biking. My only complaint was that none of the bikes would go low enough for my short legs, so I struggled a bit. I actually didn't think we had a photo of this part, but thankfully the much more balanced and skillful cyclist M snapped a few. We later learned there was a lioness spotted in the area where we were biking, but very thankfully we did not cross paths. We then spotted what must have been the darkest giraffe I've ever seen. Its spots, which I'm used to seeing as brown, were almost jet black. 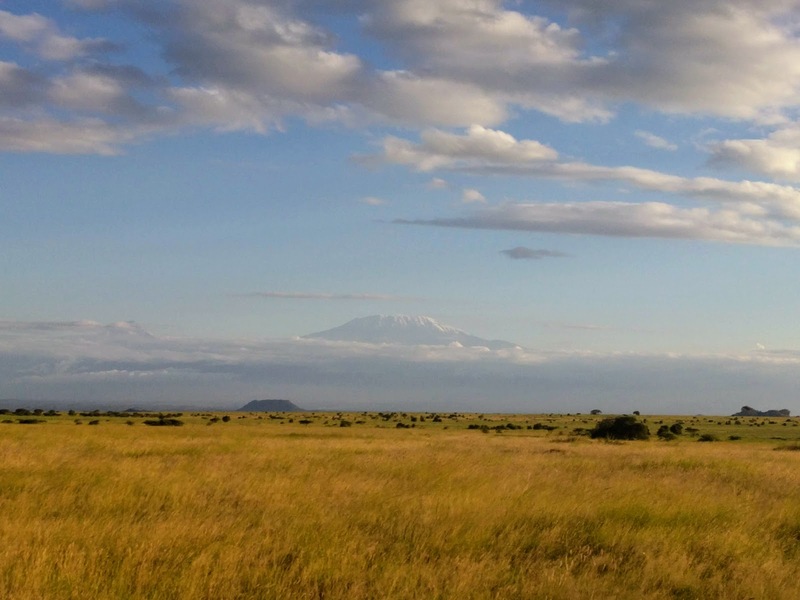 Mount Kilimanjaro also peaked out above the clouds for the first time all weekend on our last game drive. 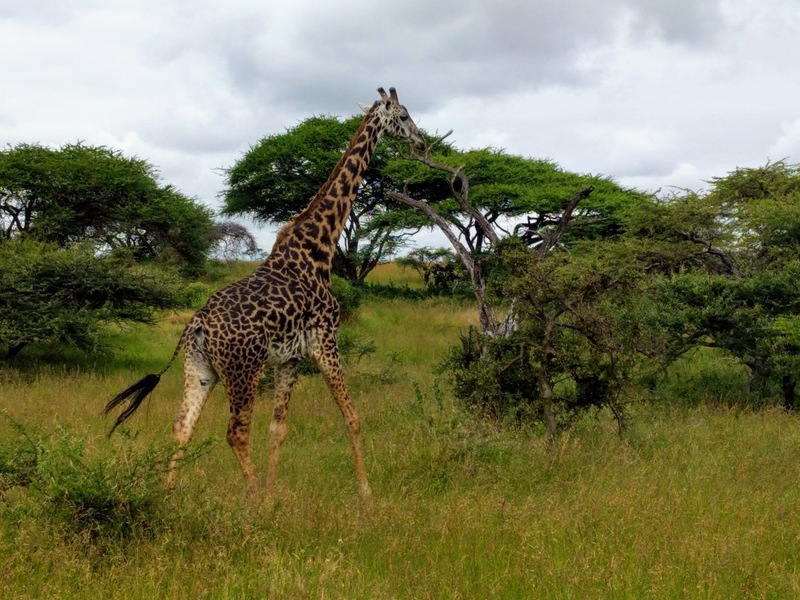 It was just as awesome as we remembered the last time we saw it, in Amboseli. Before heading back to the lodge, we swung back around to the grove where the three lions had reclined earlier the same day. They were still there, and they looked hungry! We were fortunate enough to see them get up to head off into the plains... perhaps for their next hunt? On our way back after sunset, we even saw two cheetahs - the one big cat we haven't seen on safari! It was literally our last chance on this trip to see them, so we felt very lucky. Our last dinner at Ol Donyo was yet another demonstration of the magic of the place. We ate outside under the stars surrounding by trees with hanging lanterns. The quality of service was unlike anything we'd ever experienced; every need and desire seemed to be accommodated with ease. I should mention that I was horribly sick with who-knows-what most of the weekend, but thanks to the lodge staff's endless supply of tissues, lozenges, and ginger tea I made it through without completely missing out on the vacation. 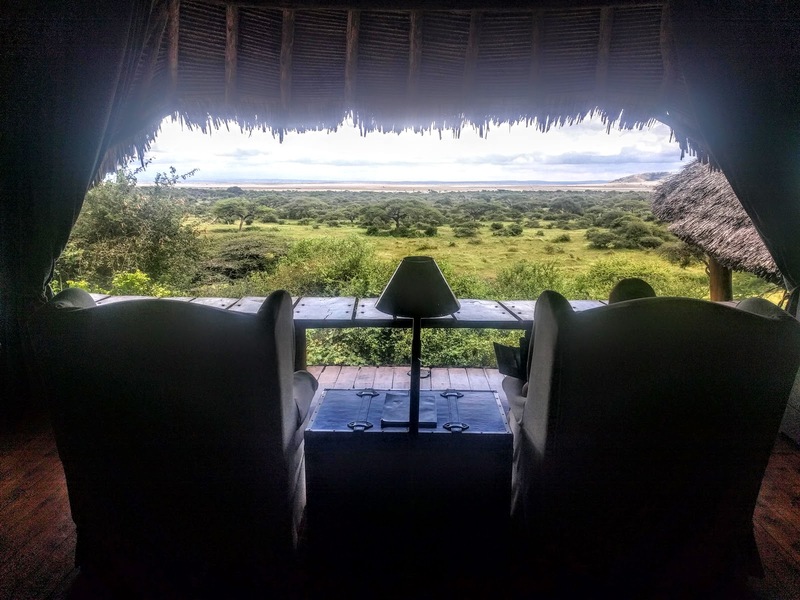 Ol Donyo is definitely a once-in-a-lifetime experience for most (with a price tag to match), but it's unlike anything we've ever done and worth it for those seeking the ultimate luxury safari!